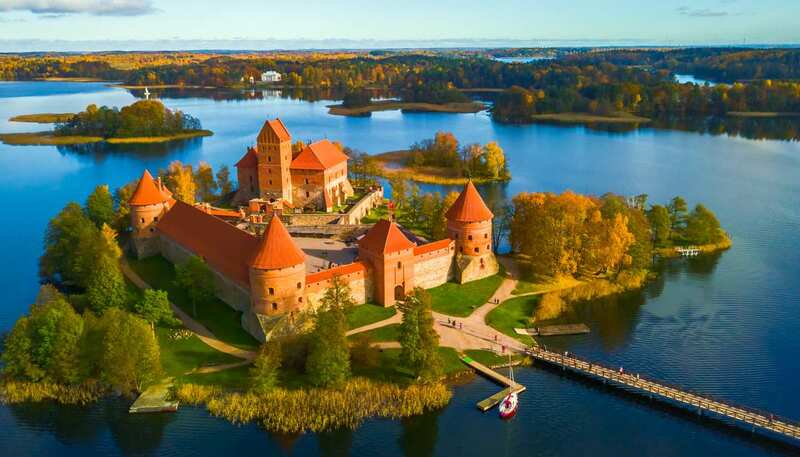 Lithuania is a spellbinding land of castles, lakes and forests. 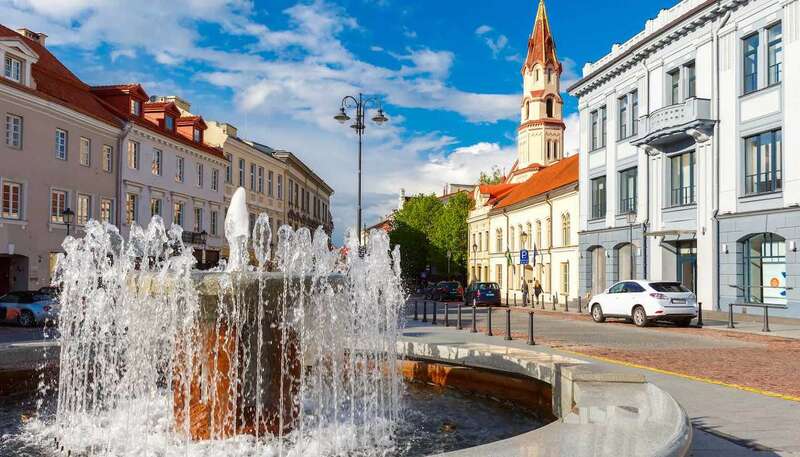 Though relatively few knew of its charms until recently, Lithuania's capital, Vilnius, is one of Europe's most enchanting cities, owing especially to its Baroque old town. Then there is the Baltic shore, which may not have the sun-soaked appeal of other coasts, but is idyllic and largely unspoilt. The southernmost country in the Baltics, Lithuania is also home to vast plains parted by hills and sand dunes. Lithuanian independence came soon after the collapse of the Soviet Union in 1991. By 1995, the transition to a full market economy had been completed. The long-running border dispute with Poland was settled with the signing of a friendship and co-operation treaty in January 1992 and negotiations with Russia led to the withdrawal of the remaining Russian troops in Lithuania in August 1993. The Russian connection remains, however, with Russians being the second largest ethnic minority in the country. 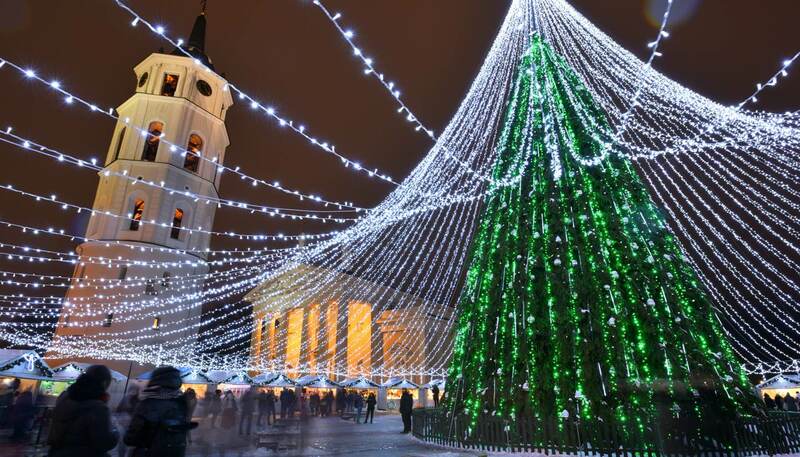 The largest of the three Baltic states, Lithuania gaining EU membership in 2004, since which time the country has been thrust on to the global stage, encouraging more visitors than ever. Most of the attraction for Lithuania lies with its natural treasures. Much of the country is verdant, with several national parks that are perfect for hikers and explorers. All around the country there are countless sprawling forests ripe for wandering, as well as numerous lakes sprinkled across the landscape. Perhaps the country's trump card is the Baltic coastline, where beguiling wetlands brim with wildlife, most notably the thousands of bird species. There's also the Curonian Spit, a stunning 100km strip of land that separates the Curonian Lagoon from the Baltic Sea, which is covered in white sands. President Dalia Grybauskaitė since 2009. Prime Minister Algirdas Butkevičius since 2012. Terrorist attacks in Lithuania can’t be ruled out. Most visits to Lithuania are trouble free. If you’re living in or moving to Lithuania, visit our Living in Lithuania guide in addition to this travel advice. If you’re travelling to Lithuania to do business or provide services, see further guidance on providing services in Lithuania after EU Exit. Call 112 if you need to contact the emergency services. There have been reports of petty theft and robbery. Beware of pickpockets, avoid unlit streets and parks at night, and be extra vigilant if you’re walking alone. Take extra care of your belongings in busy locations and on public transport. Don’t leave coats and handbags unattended in bars, pubs and clubs. A small number of tourists have reported incidents on public transport and around the train station area of Vilnius where they have been approached by small groups of people asking for money or help. Be vigilant in these areas. Don’t leave drinks unattended and be wary of accepting food and drink from strangers in bars, nightclubs and restaurants. Car theft is a problem in certain areas. Lock unattended vehicles and hide contents. Use guarded car parks in cities, especially overnight. There have been a number of thefts of bicycles in Vilnius. If you feel that you’ve been a victim of crime, call the police on 112. On local buses and trolley-buses, remember to activate your ticket (whether it’s pre-purchased or bought from the driver) on the machine on board or you may be fined by undercover inspectors. You can drive using a UK photo card driving licence. You must have suitable insurance and carry the original vehicle registration documents (copies are not acceptable). If the UK leaves the EU without a deal, you may need to get an International Driving Permit (IDP) to be able to drive in Lithuania and other EU/EEA countries. If you’re living in Lithuania, check the Living in Guide for information on requirements for residents. Take care when driving, particularly at night. Equip your car for severe conditions in winter. Winter tyres are a legal requirement in Lithuania between 10 November and 10 April. Dipped headlights are compulsory all year round. Speed limits, unless otherwise indicated, are 50km/h in towns, 90km/h on country roads and 110km/h on highways. Don’t drink and drive. The legal blood-alcohol limit is 0.04%. Those found over the limit face a fine and possible imprisonment. In 2017 there were 192 road deaths in Lithuania (source: Department of Transport), equating to 6.7 road deaths per 100,000 of population. This compares to the UK average of 2.8 road deaths per 100,000 of population in 2017. See the European Commission, AA and RAC guides for advice on driving in Lithuania. Be prepared for extremely cold and possibly hazardous weather if you intend to travel to Lithuania in the winter (October to March). There’s likely to be snow or ice on the ground and temperatures may drop to -25 degrees Celsius or below. If you intend to walk along the Curonian Spit be aware that after a short distance the Spit forms part of Kaliningrad, which is a territory of the Russian Federation. Attacks in Lithuania can’t be ruled out. You should be aware of the global risk of indiscriminate terrorist attacks which could be in public areas, including those frequented by expatriates and foreign travellers. Don’t become involved with drugs. Possession of even very small quantities can lead to imprisonment or heavy fines. You should check with the Lithuanian Embassy what type of visa, if any, you will need. 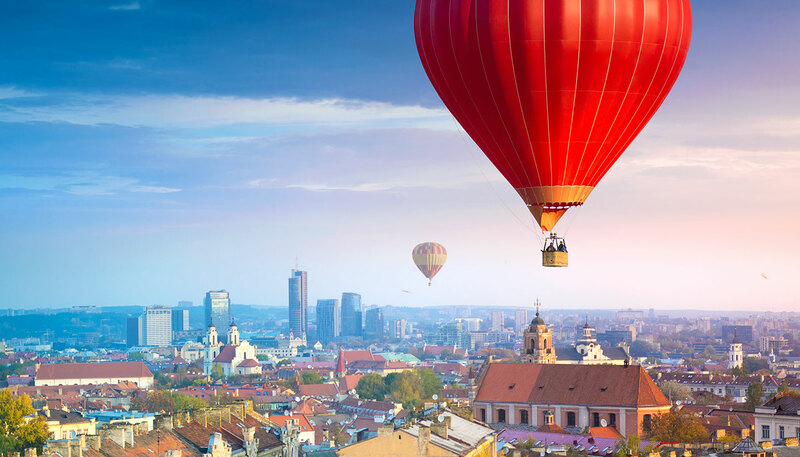 If you’re planning a stay of longer than 3 months, see our Living in Lithuania guide and contact the Lithuanian Embassy if you have further questions. UK Emergency Travel Documents (ETDs) are accepted for entry, airside transit and exit from Lithuania. If the UK leaves the EU without a deal, access to healthcare for British nationals travelling or living in the EU, European Economic Area (EEA) and Switzerland is likely to change. More information about healthcare for UK nationals living in and visiting Lithuania is available on the NHS website. The EHIC entitles you to state provided medical treatment that may become necessary during your trip. Any treatment provided is on the same terms as Lithuanian nationals. If you don’t have your EHIC with you or you’ve lost it, you can call the Department of Health Overseas Healthcare Team (+44 191 218 1999) to get a Provisional Replacement Certificate. The UK government has or is seeking agreements with countries on healthcare arrangements for UK nationals after the UK leaves the EU. The NHS website and this travel advice will be updated with further information on travelling to Lithuania as the circumstances change. If you’re living in Lithuania, you can also find more information on healthcare for residents in our Living In Lithuania guide. The currency of Lithuania is the Euro. All major credit cards are accepted and there are plenty of ATM machines for withdrawing local currency.